Hello everyone, CEO Olivia here. This week I want to bark out about a serious topic; heartworms. Today I will explain what heartworms are & why they are a serious threat to all good dogs & cats. On Wednesday I will bark about treatments, both pharmaceutical & natural. Heartworms are parasites that are transmitted by mosquitoes. Heartworm larvae, called microfilaria, circulate in the blood of an infected animal & are sucked up by the mosquito when it feeds. Once inside the mosquito, the larvae develops through several stages before they can infect another animal. For that to occur, outside temperatures must remain above 57 degrees F ( 13 C )day & night, for a minimum of 8 days. The warmer the temperature, the faster the larvae will mature. If the temperature drops below that critical level, larval development will stop; but the larvae don’t die—development will re-start at the same point when the weather warms back up. Larvae reach their infection stage in 8 to 30 days. 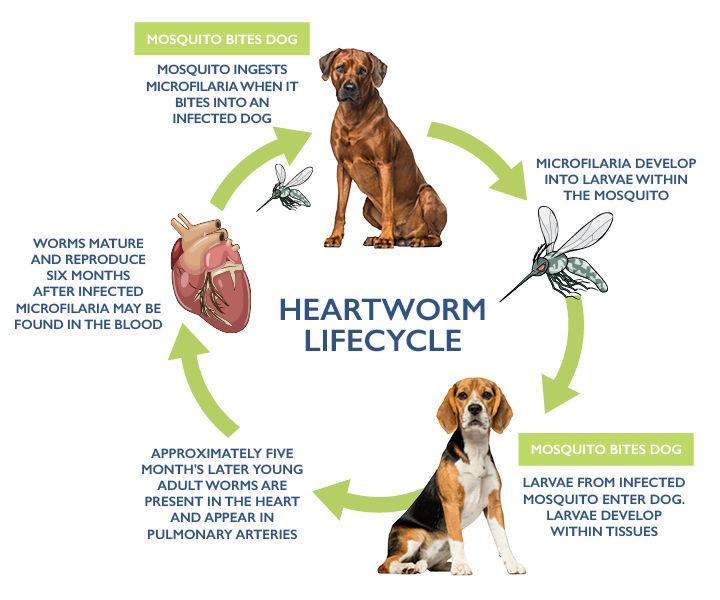 When an infected mosquito bites a dog or cat, the heartworm microfilaria are deposited on the skin, where they crawl into the bite wound & enter the bloodstream. Once inside the body, the larvae migrate to the heart where they develop into adults, reproduce, fill the blood stream with microfilaria, & pass it on to the next mosquito. It takes the microfilaria about 6-7 months to mature into adults & begin reproducing. Left untreated, heartworms can cause severe damage to the heart, lungs, & other organs & is usually fatal. Signs of heartworm disease may not be recognized in the early stages. The number of heartworms in an animal tends to accumulate gradually over a period of months or even years. Symptoms of heartworm infection may include a persistent cough, reluctance to move or exercise, fatigue after only moderate exercise, reduced appetite & weight loss. Left untreated, adult worms can live up to 7 years in a dog. With cats, more often than not, their immune system kills the larvae & clears the infection. Adult worms may still develop, but they cannot reproduce; they take about 9 months to mature, & they tend to die after a year or two. However, adult heartworms are about a foot long, so it only takes 1 or 2 to fill up a cat’s tiny heart & cause serious problems. Also the microfilaria can still cause significant inflammation in the lungs. Feline heartworm infection may be misdiagnosed as asthma or bronchitis. Well that was gross but now you know. On Wednesday I’ll share how to deal with these nasty bugs. Be sure to enter my Barkday Giveaway. You could win a Knotty Toy for your good dog or cat. Go on Facebook & visit my page, Oh, the Life of Olivia, or Knotty Toys for Good Dogs page to enter. Heartworms are really gross and scary. Thanks for the cool graphic. Looking forward to hearing about treatments!